Not all of their names are known, but every child of 1916 will now be remembered. The lives of children killed during the Rising were marked "publicly and permanently" with a special ceremony attended by hundreds of relatives. The intimate service in Glasnevin saw the names of 38 identified children who died in the violence immortalised at the cemetery's memorial wall. One child and one infant whose names remain unknown were also remembered in the emotional event, which included a wreath-laying ceremony and balloon release. Terence O'Neill from Drumcondra came to remember his first cousin, Seán Foster, who was killed in the crossfire of the Rising. Seán was in his mother's pram when a stray bullet struck him in the head. He was just two. His mother, Katie, had brought her two children with her while visiting Terence's father, who was an Irish Volunteer. Katie had entreated her brother to stop fighting and come home. When her brother refused to abandon his post, Katie walked down Church Street with the two children. Violence soon broke out and Seán was killed in the crossfire. 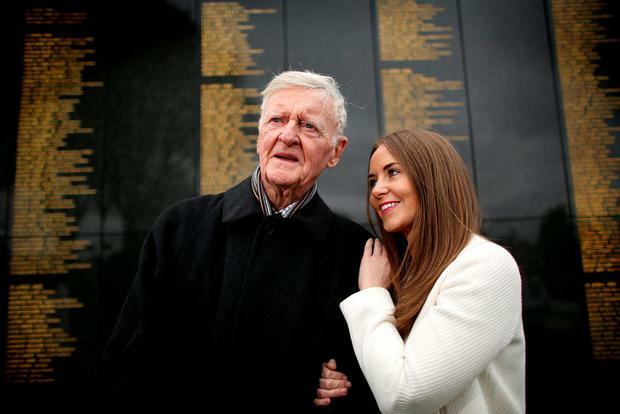 Terence (88) grew up with tales of his relatives and attended the ceremony with his children and grandchildren. "From the time when I was a child, my father used to tell me all those stories," he said. "I couldn't believe the thing that I was so familiar with has now become a historical fact. "I never knew there were 40 children killed. There's tremendous interest in it, considering it's a hundred years later." Terence said that Seán's mother "more or less blamed the Volunteers" for her child's death, which occurred just months after her husband had been killed in the Somme. "Her husband was killed a few months before that, in the First World War, so she blamed the British for that and the Volunteers for Seán's death," he said. "That didn't do her any good." Seán's death also inspired a song by Cork musician Myles Gaffney, who performed during the ceremony. Declan O'Rourke also sang his original composition 'Children of Sixteen', having travelled late at night to make it to the ceremony from a gig. Meanwhile, Scór 2016 winner Norrie Keane performed her song 'Channadh Lullaby'. RTÉ's Joe Duffy led the May Day service, which was celebrated by Father Bryan Shortall of the Capuchin Franciscans and Reverend Lesley Robinson of St John the Baptist Church in Clontarf. "It takes less than a minute to read out the names of the 40 children who died 100 years ago this week," Mr Duffy said. "But it has taken 100 years for their names to be publicly and permanently memorialised on the wall behind us. Each one of them has a story, a family, a life unfulfilled and many moments that ended too soon." Ian Begley The great grandson of 1916 hero James Connolly has said the fight to establish Moore Street as a national monument is "far from over". A book capturing the pride and spirit of more than 3,000 events held nationwide last year to commemorate the 1916 Easter Rising was officially launched at the GPO last night. The family of 1916 hero Thomas Ashe joined a large crowed of patriotic spectators in Glasnevin Cemetery to mark the 100th annniversary of his death.